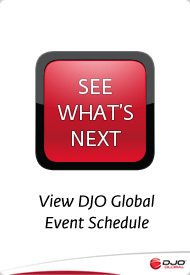 This Internet site is wholly owned and operated by DJO Global Inc. Your access to and use of this site is subject to the following terms and conditions. By accessing the site, you accept and agree to be bound by these terms and conditions. 1. You may access, download or print material displayed on this site for your non-commercial, personal use only. You may not reproduce, distribute, modify or transmit any of the content of this site (including text, graphics, audio and video) or use any of the content of this site for public or commercial purposes without our written permission. 2. We will take reasonable efforts to keep all information up-to-date and accurate but we make no representations or warranties as to its accuracy, currency or completeness. We assume no liability or responsibility for any errors or omissions in the content of this site. 3. Except for the historical information contained in this site, all statements in this web site constitute forward-looking statements. All forward-looking statements, including but not limited to statements regarding product development, receipt of regulatory approvals, the obtaining of proprietary protection such as patents, and consumer acceptance of our products are subject to certain risks and uncertainties. Actual results may differ materially from the results anticipated in the forward-looking statements. Additional information on potential factors that could affect our results is included in our most recent Annual Report on Form 10-K. We disclaim any obligation to update our forward-looking statements. 4. We offer this site "AS IS" WITHOUT WARRANTY OF ANY KIND, EITHER EXPRESSED OR IMPLIED, INCLUDING, BUT NOT LIMITED TO, THE IMPLIED WARRANTIES OF MERCHANTABILITY, FITNESS FOR A PARTICULAR PURPOSE, OR NON-INFRINGEMENT. Some jurisdictions may not allow the exclusion of implied warranties, so some of the above exclusions may not apply to you. 5. We shall not be liable for any direct, incidental, consequential, indirect, or punitive damages arising out of your access to, use of, or reliance on information from this site. We assume no responsibility, and shall not be liable for, any damages to, or viruses that may infect, your computer or other property arising from your access to, or use of, the Site. 6. The information contained in this site is not a substitute for the examination and advice of a physician or other health care professional. You are solely responsible for all actions you take after reading material on this site. Please seek the advice of a doctor for concerns about your health or how to treat a specific condition. 8. While we value your feedback on our products and service, we do not accept or consider product or service ideas, inventions, improvements, techniques, drawings or other materials other than those we have specifically requested in writing. We do this to avoid any misunderstandings when products or services we develop seem to be similar to creative works you submitted. If, despite our request, you do submit your creative works, these creative works will be deemed to be our property. We will be entitled to use them without restriction and without payment of any compensation to you. We have no obligation of confidentiality with respect to unsolicited creative works submitted to us, and will not be liable for any use or disclosure of any unsolicited creative works submitted. 9. This site may provide links or references to other Internet sites. Any links to other sites are provided as a convenience. These links should not be interpreted as an indication of our endorsement or sponsorship of any information, products or services described in those sites. We do not monitor those web sites, and are not responsible for, the content of those sites, and we have no responsibility or liability for the content of such sites. 10. We may from time to time monitor or review on-line discussions and postings to the site. We are, however, under no obligation to do so and assume no responsibility or liability arising from the content of such discussions or postings. Posting or transmitting any unlawful, threatening, defamatory, obscene, inflammatory, pornographic or profane material, or any material that could constitute or encourage conduct that would violate any law, will cause us to terminate your access to this site. 11. Unless otherwise noted, we own the copyrights to all content on this site and all of the trademarks, service marks, trade names, trade dress and products on this site. Each of these are protected in the United States and internationally. No use of any of these may be made without our prior, written authorization or, if owned by a third party, the prior, written authorization of such third party. 12. All matters related to your use of this site and these terms and conditions shall be interpreted in accordance with California law. We may from time to time revise these terms and conditions by updating this page. You are bound by any such revisions when posted and should therefore periodically visit this page to review the latest terms and conditions.